(CNN) Iran launched a satellite on Tuesday that failed to reach orbit, after the US warned against the launch earlier this month. The satellite "did not reach enough speed in the third stage and was not put into orbit," Mohammad Jahromi, the country's Minister of Communications and Information Technology, told the official IRNA news agency after a ceremony was held for the launch at Imam Khomeini Spaceport early Tuesday. The minister said Iran would launch another satellite soon. Images show Iran prepping satellite launch despite Pompeo's threat US Secretary of State Mike Pompeo warned Iran earlier this month to scrap its planned satellite launch, threatening to increase sanctions on the country. He issued a statement Tuesday condemning the launch but did not say whether the US plans to levy new sanctions against Iran in response. Read More "We have been clear that we will not stand for Iran's flagrant disregard for international norms. The United States is working with our allies and partners to counter the entire range of the Islamic Republic's threats, including its missile program, which threatens Europe and the Middle East," the statement said. An image taken on January 4 shows a large truck parked at the mobile launch gantry of the Iranian spaceport. 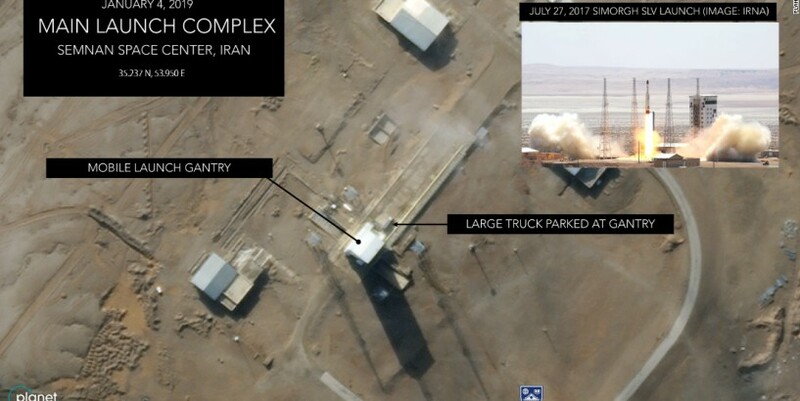 Pompeo has argued that such space launches violate a UN Security Council resolution passed in support of the 2015 nuclear deal, saying in a statement on January 3 that Iran's launch vehicles "incorporate technology that is virtually identical to that used in ballistic missiles, including in intercontinental ballistic-missiles (ICBMs)." Mike Pompeo's long, strange tour through the Mideast On Tuesday, Pompeo reiterated that assertion, saying the satellite "launch furthers Iran's ability to eventually build such a weapon." Analysts have told CNN that the technology does not use ICBMs and Iran has said its satellites are for telecommunications. Pompeo has just ended a whirlwind tour of Arab countries intended to calm fears about the imminent US withdrawal from Syria and rally support for the Trump administration's hard line against Iran. In a speech in Cairo last week, Pompeo touted the administration's withdrawal from former US President Barack Obama's landmark Iran nuclear deal and spoke extensively of the US "campaign to stop Iran's malevolent influence and actions against this region and the world." Tough talk, despair divide Tehran's streets as sanctions strike US President Donald Trump has slapped Iran with two rounds of aggressive sanctions this year, spurring a flight of foreign companies from the country and crippling its economy, with spiraling inflation rates and shortages of food and medicines. A Norwegian plane has been stuck in Iran for four weeks after a technical error prompted a unscheduled landing in Shiraz airport en route from Dubai to Olso. Export restrictions have meant the aircraft has not yet received the spare parts needed for it to take off again.